As usual with Sinevibes software, Sequential has a clean, colour-coded interface which is extremely easy to use. With lively animations and instant responsiveness, it offers a really organic, natural user experience. Altogether, this makes Sequential an extremely capable and inspiring tool that completely re-architects loops, creates unique breaks, fills and transitions, or turns any static, lifeless sound into a dancing masterpiece. – Improved user interface with thicker, more legible font. 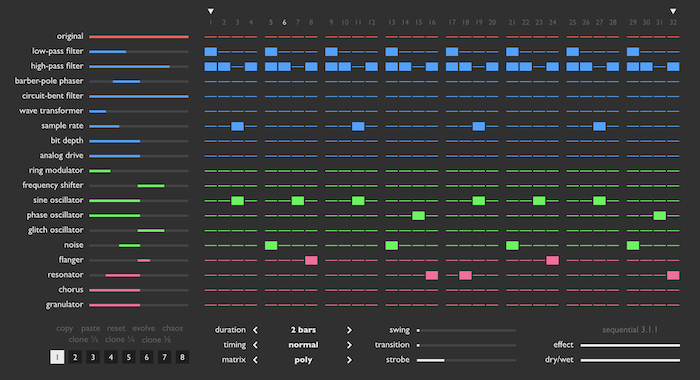 – All-new, more precise and efficient step sequencer algorithm. – Reduced processor load thanks to all-new, more efficient parameter and gate lag filters, improved bulk parameter handling, optimized input/output stages. – Fixed lag filters not calculated correctly for sample rates other than 44100 Hz. – Fixed transport sync not updating if playhead jumps to an earlier location. – Fixed incorrect swing timing when sequencer step count is an odd number.